The Recipe: My latest "master vegetable recipe" – this time shrimp stir-fried with your choice of fresh summer vegetables and tossed in an addictive sweet 'n' sour hot sauce. 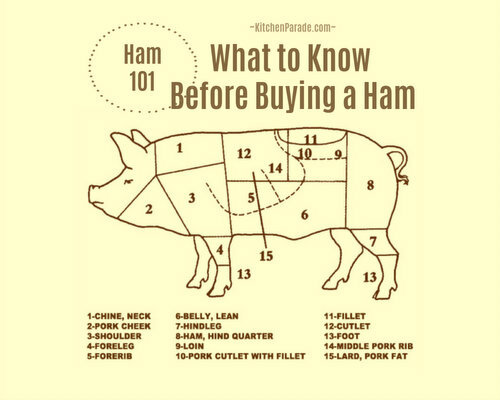 It makes up quickly, just prep and cook! This is an easy weeknight supper recipe but the taste is worthy of a special occasion too. Low carb, Weight Watchers friendly, gluten-free, easily adapted to paleo. Strict seasonal eaters, look the other way, please! Of course, home-grown asparagus is long gone for most if not all of us. But the second crop of asparagus from somewhere down south has just hit the grocery stores: so fresh and summery! And besides, this is the latest in a series of “master recipes” for vegetables, a recipe that works with many different vegetables, a recipe to make again and again, rarely the same twice. So you see? Local green beans? Garden broccoli? Tiny Brussels sprouts from your CSA? Pretty snow peas or sugar snap peas or okra from the farmers market? All would be fine seasonal choices! VEGETABLE SUBSTITUTION SUGGESTIONS Variety makes this dish extra appealing so aim for a mix of colors and shapes. The smaller the pieces, the faster the vegetables will cook. Slice thin carrot coins, say, instead of large carrot chunks; cut cabbage into fine ribbons and Brussels sprouts, even small ones, into halves or quarters. 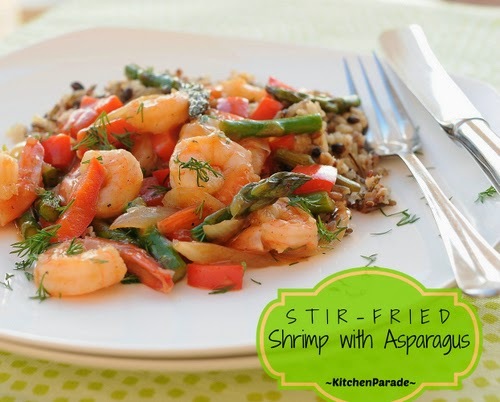 For the same reason, this recipe works best with thin or medium-thick asparagus. Save the fat spears of asparagus for roasting. In addition, the asparagus tips cook slightly more quickly so set them aside and add once the stalks, peppers and onions are almost cooked. This isn't "required" but is one of those insider, experienced-cook tips that makes a difference in taste and looks. ALANNA’s TIPS Once you start cooking a stir-fry, it all moves really quickly. That’s why it’s important to prep everything before heating the skillet. Temperature is important here, that's why in the recipe I've emphasized the changes in temperature. The vegetables are cooked quickly on high heat, the shrimp is cooked quickly but at a lower heat to avoid toughness. For make-ahead, a couple hours before cooking, even the morning of serving, you could peel and devein the shrimp ahead of time; mix and refrigerate the Sweet & Sour Hot Sauce; and prep the vegetables. Both fresh and frozen shrimp work beautifully here. I keep a pound or two of frozen shrimp from Target in the freezer, very handy for a last-minute weeknight supper. To thaw the frozen shrimp quickly, immerse the unopened package in a bowl of cold water for about 30 minutes to thaw. Sugar? I know. I some times substitute maple syrup or honey but don’t skip the sweetness. Peanut oil has what’s called a “high smoke point” – this means it can tolerate the higher temperatures used in stir-frying. That said, I’ve used olive oil here too, even though it has a lower smoke point. SHRIMP Combine ingredients in a bowl, let rest at room temperature while prepping the remaining ingredients, no more than 30 minutes. SWEET & SOUR HOT SAUCE Combine all ingredients in a bowl. VEGETABLES Prep the vegetables and collect in a bowl. STIR FRY VEGETABLES (MEDIUM HIGH HEAT) Heat oil in a large non-stick skillet (I use cast iron) on medium high heat until a flick of water from your fingertips snaps and sizzles. Add the vegetables and stir fry, stirring frequently, until vegetables begin to turn color and are almost cooked (see TIPS). Transfer back to the bowl. 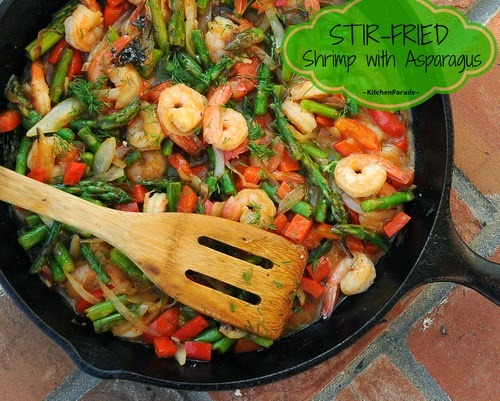 STIR FRY SHRIMP (MEDIUM LOW HEAT) Reduce heat to medium low. Cook shrimp, stirring frequently, until shrimp are light pink on both sides, about 60 to 90 seconds. ADD SAUCE (HIGH HEAT) Return to high heat. Stir in sauce and cook, stirring constantly, until sauce thickens and shrimp are cooked through, about 1 to 2 minutes. ADD BACK VEGETABLES (HIGH HEAT) Add vegetables and toss, just to heat through. Sprinkle with fresh herbs. SERVE tableside with rice, Oven-Baked Brown Rice is my favorite here. NUTRITION INFORMATION Per Serving: 256 Calories; 7g Tot Fat; 1g Sat Fat; 172mg Cholesterol; 433mg Sodium; 10g Carb; 2g Fiber; 14g Sugar; 25g Protein. 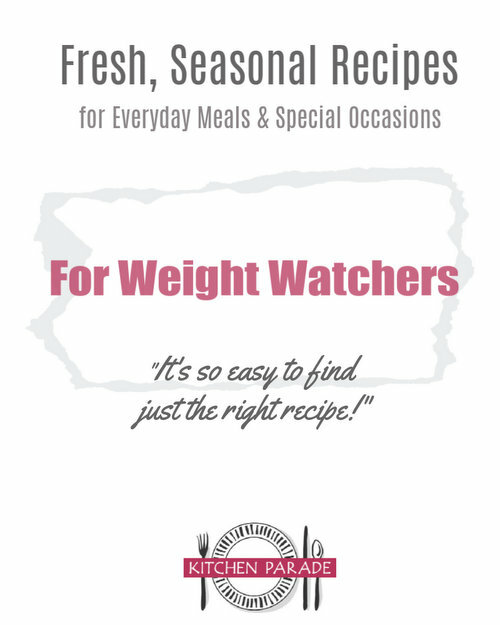 WEIGHT WATCHERS POINTS WW Old Points 5, WW PointsPlus 5 This recipe has been 'Alanna-sized' with reductions in fat and increases in crunch and nutrition from extra vegetables. This looks so yummy, and thanks for including all the veggie options so I can customize based on what's in the farm share box. I even think this recipe can be followed by the "branching out in the kitchen" kids this summer.